There is massive demand for very high-speed broadband supporting more than 100 Mbit/s and up to 1 Gbit/s. This demand is driven by the combination of the rapidly-growing bandwidth required by applications, including HD video and the dramatic increase in the number of connected devices in each home. Companies providing broadband services over traditional telephone lines, new fiber connections and existing cable coax are all competing to provide the best combination of bandwidth, cost and added services. The first service providers are now offering 1 Gbit/s over fiber connections using passive optical networking (PON) or point-to-point active Ethernet. The recent development of Docsis 3.1 will enable cable TV operators to dramatically increase the data bandwidth available to subscribers. VDSL2 was developed to enable very high-speed broadband services over the copper lines originally installed by telecom companies to provide traditional telephone services. After a long incubation period, and the development of vectoring and bonding technologies, VDSL2 services are now starting to support data rates of 100 Mbit/s and above. G.fast, and VDSL2 with vectoring and bonding, allows telecom service providers to compete successfully with fiber and cable service providers in delivering high-speed broadband services supporting 100 Mbit/s to 1 Gbit/s. The extension of FTTdp is an attractive compromise for both service providers and their customers between the high cost of FTTH and the limited data rates supported by longer copper lines from the CO or cabinet. These technologies give telecom companies the opportunity to hold on to customers and win new customers that might otherwise be tempted with very high-speed broadband services from either fiber service providers or cable companies. The development of G.fast and Docsis 3.1 will allow telecom and cable companies to offer close to the magical 1 Gbit/s already on offer from the first fiber service provider. More critical to the market, however, is how cost effectively these companies can utilize these different technologies to provide cost-effective broadband in the 100-500Mbit/s range. This is the market that will represent the biggest opportunity as consumers upgrade more of their connected devices to HD and ultra HD video. The rapid speed with which the industry has developed the G.fast specifications and companies have introduced the first chipsets will enable telecom service providers to offer these services during 2016 and should allow them to compete effectively against the cable and fiber competition. G.fast Turbocharges Next-Generation Access details and analyzes chipsets from four leading vendors in this important market as they start to provide the first solutions that support G.fast and continue developing solutions for VDSL2 and ADSL2+. The report profiles the vendors and reviews specific platform architectures, identifying the key features and highlighting the advantages they hold for system developers and service providers. G.fast is a new technology that has been developed using the lessons learned by companies deploying VDSL2. G.fast supports up to 1 Gbit/s over short copper lines with FTTdp and reverse power. 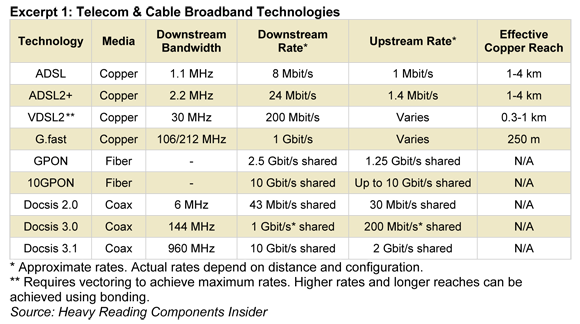 The excerpt below shows how G.fast compares to other key telecom and cable broadband technologies. Companies profiled in this report include: Broadcom Corp. (Nasdaq: BRCM); Ikanos Communications Inc. (Nasdaq: IKAN); Lantiq Semiconductor; and Sckipio Technologies.